Ture Richard Turnbull has spent the last 14 of his 36 years in Jamaica Plain. He comes from a large, modern family with 8 sisters and 2 brothers (14 nieces and nephews) and has made Boston his family's home with his husband of 5 years, Adam Smith. In 2004 Ture moved to his brother's home on Dunster Rd. in Jamaica Plain and enrolled at Northeastern University to receive his B.S. in Public Administration (International Affairs Specialization) followed by a Masters in Urban and Regional Policy. Ture went on to receive a certificate of education in Shaping Healthcare Delivery Policy from the Kennedy School of Government at Harvard University. Throughout his educational endeavors he became civically active by joining the Democratic Ward 11 committee in 2009 and started his career in public service within the state’s legislature. From 2006 to 2012, Ture worked in the Massachusetts State House, serving both in the House and Senate, working side-by-side with constituents, community leaders, and elected officials fighting for social and economic justice. Ture worked in Boston City Hall for nearly another year before becoming the Executive Director of the statewide advocacy non-profit, MassCare. For the last 5 years, Ture has been directing MassCare, leading the fight for healthcare justice and for the creation of a Medicare for All / Single Payer healthcare system. In October of 2017 was able to include landmark single payer language into the Senate’s healthcare omnibus bill with a 35-3 vote, which is currently waiting to be brought up by the House. Ture advocated and secured $500,000 for youth suicide prevention when he served as a Commissioner on the Massachusetts Commission on LGBTQ Youth. Ture also has advocated for a number of issues that face our community. He has coordinated efforts to increase funding for the Gay Men’s Domestic Violence Project, increases to the Mass Cultural Council's budget, marriage equality, fought to eliminate healthcare disparities and increase treatments for addiction, and the front of urban planning, he fought for comprehensive zoning reform to address the housing crisis. Ture has run the Boston Marathon 4 times, once for the Massachusetts Association for the Prevention of Cruelty to Children, and will be running again this April. 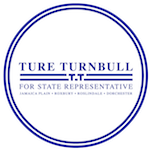 Ture is running for State Representative because he brings a new view that is needed on Beacon Hill, and he has the experience, energy, and commitment to help guide the Commonwealth into the future. Ture's campaign has been given the Moms Demand Action Gun Sense Candidate distinction.